Chesterman Beach is one of the elements that anchors life in Tofino. It is where we walk with family, friends and pets, venture out for surfs and migrate to in the evenings for sunsets, beach fires and rejoicing. Chesterman Beach stretches for over 3 km from Rosie Bay, sweeping out to Frank Island, and then northward to the Wickaninnish Inn. The beach gets its name from John Phillip Chesterman who was an early white settler to the area. He acquired crown grants for the area in 1915 and lived on a homestead on the inlet side across from the beach that now bears his name. John Chesterman was a coxswain of the Tofino lifeboat and was a budding prospector trying to develop a copper and gold mine on Meares Island. 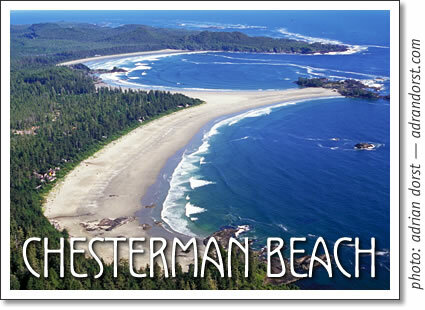 Chesterman Beach is a popular destination for activities as varied as kite flying and bacci balls to surfing and skim boarding. Families flock to it for fun filled days of sand castle building and lazy days of sun bathing. The south end is a fantastic playground for the family with tide pools and sea caves all accessible at low tide (Make sure you consult a tide table before venturing out). During the colder months of the year mussels and goose neck barnacles can be harvested there, but be sure to check with fisheries before doing so. For the naturalist Chesterman Beach is an ever changing place of wonder and beauty. In the spring and fall shorebirds flock their as a stopping ground along their migratory route, whales cruise its shores through out the spring and summer, eagles and osprey can be witnessed hunting, mating and playing, otters will cross your path and jelly fish, shells and seaweeds are scattered from end to end. Please respect the natural elements, don't let your dogs chase the shore birds and try to fight the urge to collect sand dollars. One of the main activities enjoyed on Chesterman Beach is by far surfing. It has been rated as one of the top 10 places in North America to learn surfing and has something to offer for both pro and beginner alike. The northern section is great in the winter time when Cox Bay is too big. It needs a higher tide and south easterly winds for best surfing conditions. The southern section works with westerly winds and south swells. Both sections can be forgiving to beginners but can also be quite big and challenging in bigger swells. If you’re wandering the streets of Tofino and a conversation finishes with “lets meet up later at the beach”, its likely they mean Chesterman Beach. Tofino beaches: Chesterman Beach in Tofino, British Columbia on Vancouver Island, Canada.